I love knot tying. The math of fancy knots and precision necessary to get them tied right, and the usefulness of being able to tie the right knot when needed. 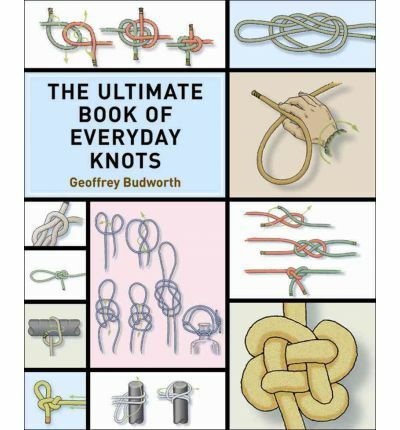 This collection of "everyday knots" is written by one of the founders of the International Guild of Knot Tyers, Geoffrey Budworth who also wrote the Ultimate Encyclopedia of Knots and Rope Work. The book includes wonderful color photos using ropes and strings that show the knots well and very clear step by step diagrams for tying each knot. The knots each have an introduction which explains possible uses for it. 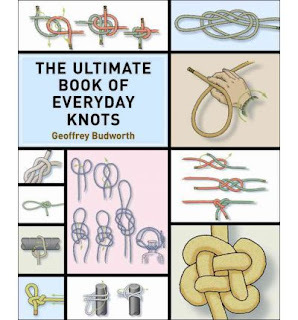 At the end of the book are good resources for knot tying and supplies as well as a glossary of knot terms and a good index. Unlike my purely decorative knot books, this was one that interested my husband as much as me. The instructions are very clear, and he enjoys more practical knots very much. The various stop knots and the hitches were his favorites. My son, who works in paracord loved the handy knots like the bottle slings. My favorites were the various knots that can be used to tie lanyards, as well as the knots for carrying things like bottles. 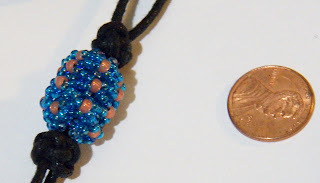 Following the diagrams for the knife lanyard knot in a cotton waxed 2 mm cord, I tied two very attractive knots then finished with figure 8 slip knots to make a lovely lanyard that I was able to decorate with a spot of beadwork. The knots covered are a variety of hitches which are used to attach a line to a fixed object, two bottle slings to hang a bottle with, fixed knots which are knots which remain in place securely on a cord, some with loops for things like mountain or rock climbing, others bulky enough to form a stop on a cord, and various sliding knots that have lots of uses. These are reliable knots, most of them fairly simply tied. This book is perfect for a beginning knotter. It's already a favorite for my family.